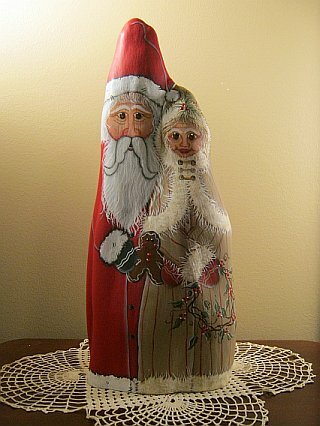 I've painted this dual pointed cypress knee as Santa and his wife. He is 16" tall and she is 13". The base of the knee is 7 1/2" wide. 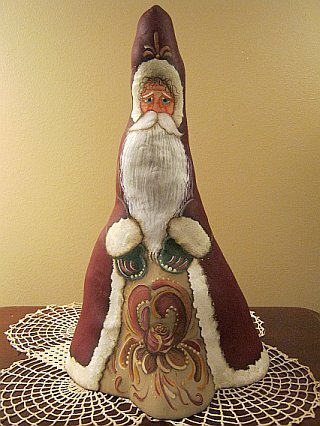 Santa in his red button-up robe is reaching for a gingerbread cookie. Mrs. Claus is wearing a beige striped robe with a hooded cape. She carries a grapevine wreath. This big cypress knee is 23 1/2 " tall and 10" across the base. Santa's robe is beige with white fur trim. The pine needle green underskirt is accented in gold. He is holding a pine garland. 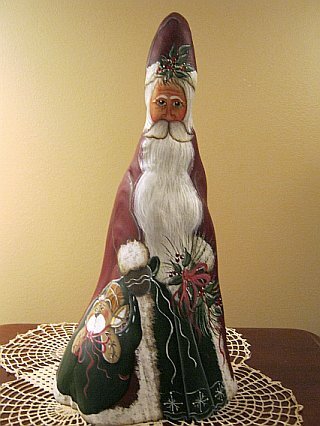 What this Santa lacks in height, he makes up in width! While he is only 12" tall, his base is 8" wide. He's still big enough to carry a bundle of holiday greenery. His Christmas red robe is worn over a pine needle green underskirt that has been accented with roses. 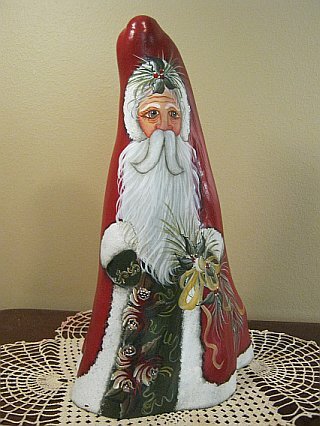 This 18" tall, hand painted,cypress knee Santa Claus is OOAK! Santa's robe is pine needle green with white stripes and fur trim. He holds a candle in his hands while his toy bag rests beside him. In the red and white striped bag is a large toy elephant. 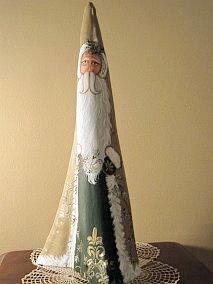 This 17 1/2" tall cypress knee features Santa wearing a Christmas red robe over a charcoal underskirt. He carries a long garland of holiday greenery. 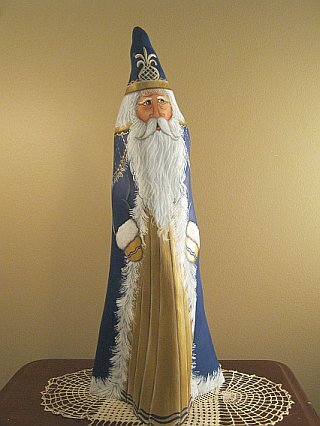 This 15" tall cypress knee with a 8" base has been handpainted as Santa wearing a black cherry robe with cream fur trim. His pine needle underskirt features snowflakes. He carries a bag holding a teddy bear, baseball, basketball and drum in one hand and a bundle of holiday greenery in the other. 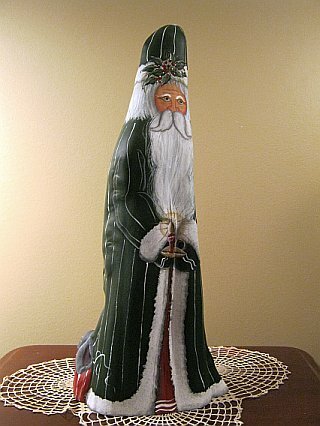 This 15" tall cypress knee with a 9" base has been handpainted as Santa wearing a black cherry robe with cream fur trim. His beige underskirt features Norwegian scroll work. The design is based on one by Gayle Orman. 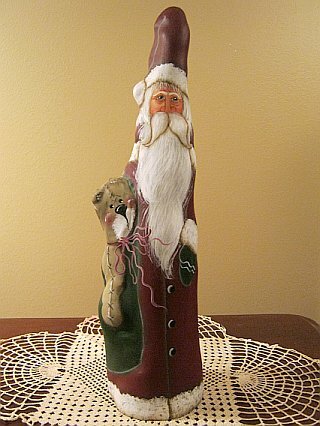 This 14" tall cypress knee with a 3 1/2" base has been handpainted as Santa wearing a black cherry , button up robe with white fur trim. His toy bag holds a very large teddy bear. 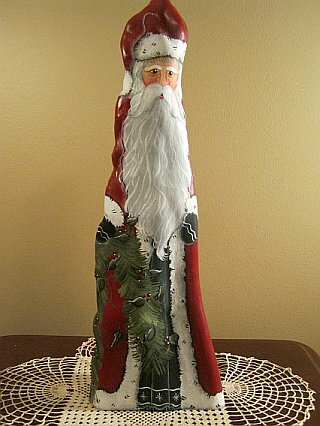 This OOAK cypress knee Santa is 23" tall and 9" across the base. His deep blue robe, trimmed in white fur, is topped with a cape featuring the "S" monogram. The underskirt is gold. 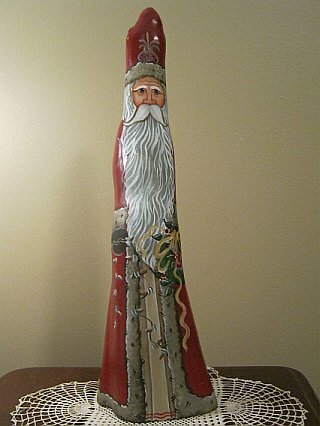 This 21" Santa has been painted on a cypress knee. His robe is Christmas red with taupe fur trim. The underskirt is beige with red accents. In one hand he holds a traditional wreath adorned with a red bow. In the other he holds a string of holiday lights.